Making a Meeting Matter: What Makes an Impact? Those of you who have been involved with AHB for a long time, probably know about or maybe attended, one or more of the three large poplar-focused meetings we’ve held over the course of the project. The Poplar Marketing Meeting in 2015, the Poplar/Willow National Working Forum in 2016, and the TREES Summit in 2017 were the culmination of years of research, networking, and expanding the research impact of AHB. In addition, AHB played an instrumental role in the National Energy Extension Summits (NEES) by hosting the 2015 Summit in Seattle and has continued to be active in the National Energy Extension Initiative (NEEI). 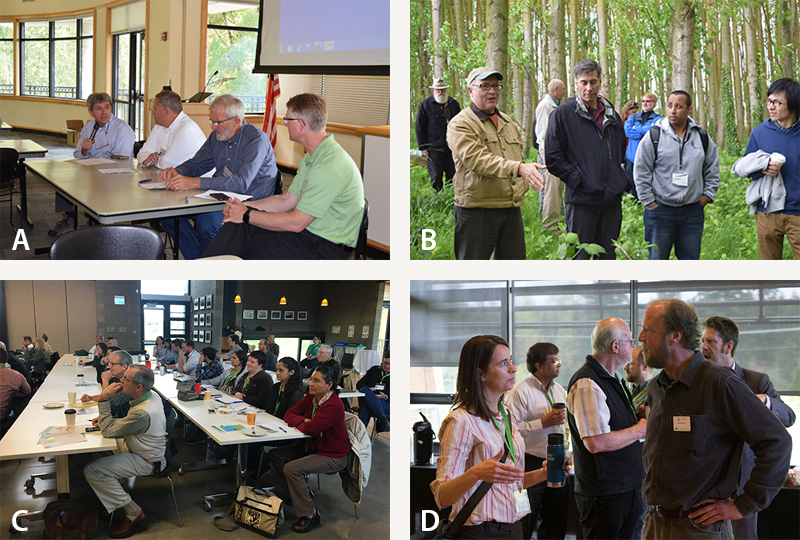 Attendees and panelists at the Poplar Marketing Meeting (A) in 2015, the Poplar/Willow Forum (B) in 2016, and the TREES Summit (C, D) in 2017. The meetings were well-liked and well-attended, but as the AHB project comes to a close, we wanted to know: What long-term impacts did the meetings have? It turns out- quite a lot! We used three different methodologies to hear what participants had to say. 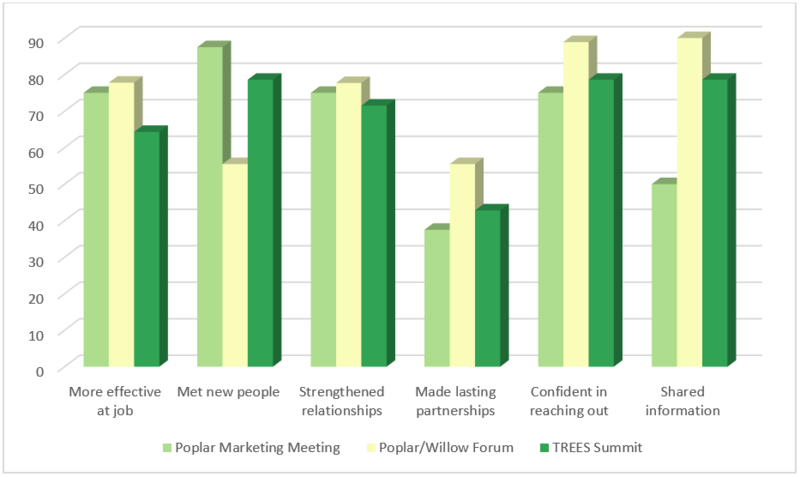 For the three poplar-focused meetings, we developed a survey for attendees and interviewed participants who attended all three meetings. From the survey we know that most respondents agreed that attending the meetings made them more effective at their jobs (72.5%), helped them strengthen relationships with other relevant attendees (75%), and gave them the opportunity to meet new people (70%). Interestingly, there seem to be some differences in the three meetings. For instance, the Poplar/Willow Forum did not seem to be as effective for meeting new people, but it resulted in more lasting partnerships. Figure 1: Percentage of respondents at the three meetings who agreed, strongly agreed, or confirmed the above statements. The interviewees provided some potential “whys” for these differences. One respondent said that the Poplar/Willow Forum felt like “a big family gathering” and that working towards a specific goal in the breakout sessions (providing information for the Poplar/Willow Roadmap) heightened focus and energy. Whereas the TREES Summit and the Poplar Marketing Meeting were more about sharing new information and bringing together many different kinds of stakeholders. To evaluate the impact of NEES and NEEI, we wanted to get the details on the programs and events that would not have occurred without the NEE Summits. It can be tough to predict all the different possibilities in a survey and interviews are labor-intensive. At the Association of Natural Resource Extension Professionals (ANREP) conference in Mississippi this spring, we gathered as many NEES attendees as we could and held a Ripple Effect Mapping session, which is a technique to visually show the “ripples” or offshoots of a particular program. 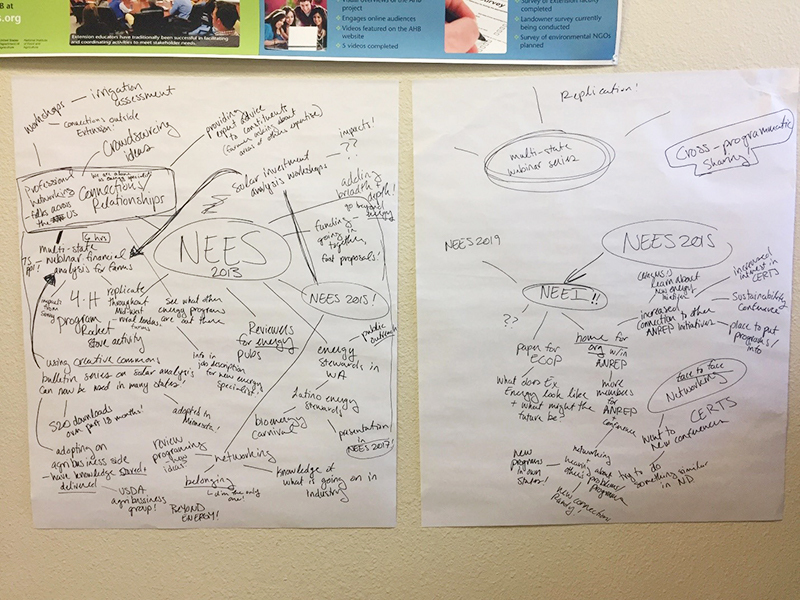 Figure 2: Attendees of NEES 2013, 2015, and/or 2017 created this ripple effect map in a little over an hour at the ANREP conference. We’ve converted the handwritten map to a more comprehensible digital version and hope to keep adding impacts! So far, we know that NEES and NEEI have increased cross-state and cross-programmatic sharing, leading to multi-state webinars and bulletins and the creation of replicated programs, like community energy stewards. In addition, the NEES meetings provide a much needed opportunity to network in person, decreasing the feeling of isolation some energy Extension agents experience. Did you attend any of these meetings and want a chance to add to the evaluation? Send me an email at cat.gowan@wsu.edu!